Behind the Mic—Guest Bill Downes – Welcome to the 2019 Beemie Awards! Bill Downes has been a Midwest staple over the last decade as the regular voice of Beulah Park and now as the race caller at Indiana Downs. Bill’s also been the announcer at Presque Isle Downs, Ellis Park, River Downs and Arapahoe Park. An avid handicapper, Bill has qualified for the National Handicapping Championship 8 times!! You can find him on twitter @Billdownes1. How did you get the horse racing bug? BD: My Dad used to take me to the track as a kid whenever I didn’t have a game to play. My hometown track was Arlington. I vividly remember as a teenager waking up and hearing Arlington was burning to the ground. My Dad and I had a consecutive streak of seeing the Million in person from 1981 to 2005 including the Million that took place in Toronto, Canada in 1988. The streak was broken when my Dad helped me move to Las Vegas in 2006. BD: Luke Kruytbosch arranged for me to call some races down on the Arizona Fair Circuit at Rilito to get used to hearing myself on the microphone. It was really funny since they had this rope that you had to tie around your neck and it had to be just right to speak into the microphone. I just remember speaking really quickly, being real keyed up, and thankfully getting the winner right. Many announcers have had to move to pursue this career, how many times have you had to move and any good stories from the road? BD: I have moved so many times that I can barely remember some of the addresses I have lived at. It’s a part of the job. You have to go where the opportunities are. You’re an avid contest player, how did you get into those and do you handicap differently for a contest than a regular day at the races? BD:The biggest difference between the two is that a 5/2 winner in regular betting can lead to a gigantic day at the windows where a 5/2 winner in contests usually doesn’t lead to winning a contest. You can’t play even money to 3/1 shots all day and win a contest. Playing in contests are a ton of fun. I have had some pretty good success over the years in tournaments. I have qualified for the National Handicapping Championship (NHC) 8 times with my best finish being a 15th place finish. I started playing in contests after hearing about the NHC after the first year it was held. Beulah Park is coming to an end and moving to Mahoning Valley. What are your emotions about Beulah closing? BD: I started at Beulah Park in September of 2001 and the final closing day is May 3, 2014. I sometimes can’t believe I’ve been here this long. There are not many race tracks running in the winter time and the big winter tracks usually have established announcers. Beulah Park has allowed me to be a full time track announcer all these years. I’m sure I will look back more as the last day approaches. It will be strange when I say goodbye to good old Grove City, Ohio. Indiana Downs has become a really great meet, how was your first season there and do you think ID will continue to grow? BD: Indiana Downs is a sleeping giant. I think InD could be the next Tampa Bay Downs/Oaklawn success story. The day to day racing rivals quite a few bigger circuits. 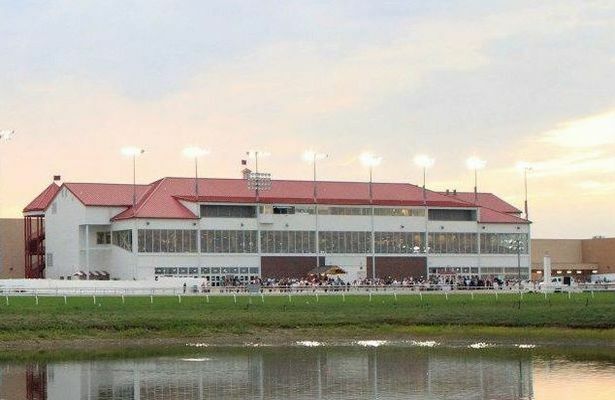 Indiana Downs was bought early last year by the same people who own Hoosier Park and all of the thoroughbred racing now takes place at Indiana Downs and all of the harness racing takes place at Hoosier Park. The sale happened right before the start of the 2013 racing season and some improvements had to wait to this year. Indiana Downs will have a new dirt surface for the 2014 season as well as a new tote board and jumbo tron. Indiana Downs was a night time track and management experimented with a daytime post time the final weeks of the 2013 season. This year, InD will race during the day on Tuesdays, Wednesdays, and Thursdays (when we run 5 days a week) and run at night on Fridays and Saturdays. BD: Luke Kruytbosch was a mentor of sorts for me but he was one of my best friends. I met Luke while he was the track announcer at Hollywood Park and I worked in publicity doing the telephone/radio results job. I would practice announcing on the roof at Hollywood and Santa Anita and Luke loved to listen to my race calls. Luke was the guy who told me to give this announcing thing a chance. All the stories about Luke are true. No one and I mean no one had a bad thing to say about him which is practically unheard of in horse racing. Luke loved imitating other track announcers and sportscasters but he always was on the lookout for every day people who looked like celebrities and he would shout out a celebrity’s name at a bar or sporting event and point to a person and most of the time the resemblance was quite striking. Luke passed away in 2008. I wanted to do something to remember him even if it was very subtle. I decided that every day announcing that I would use his “They’re off and running” start call as my start call for my first race of the day. In 2014 you have a “Call any race” card that you can cash in whenever you want. Which race would you cash it in to call? BD: I grew up in Chicagoland therefore the Arlington Million. My Dad was a minority owner in some horses in Chicago a few years back and if I could turn back the clock then I would have loved to call any of the wins. What’s been your favorite race call you’ve had? And your least favorite or worst? BD: I am my harshest critic. I listen back to every call at least once. I was really happy with last year’s Indiana Derby. It was the biggest race of my announcing life. It was a big field and it started to pour rain 30 mins before the race. The announcing Gods were testing me. Every announcer blows calls. A track announcer has to be like a relief pitcher in baseball when he blows a save. Forget about it and get the next race right. 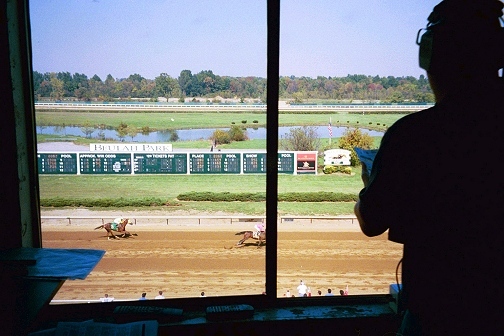 As a serious handicapper, what are some of your most memorable scores at the track? BD: I hit a pick 6 this summer at Del Mar for $19,000 which was awesome but I missed a pick 6 two weeks later at Del Mar by a head when my 27/1 shot lost to a 40/1 shot. Thankfully, it wasn’t the last race of the sequence or I might have gone on tilt.